CHICAGO (No Spoilers!) – I felt privileged on Tuesday morning. Not just to be a Chicago film critic, but to be a movie lover. Film critics and movie lovers alike wade through scores of yawners hoping for one or two masterpieces that remind us why we fell in love with the experience of watching a film in the company of people we like. Just in time to close out 2015, we’re met with the rare opportunity to take part in moviemaking magic once more. “Star Wars: Episode VII - The Force Awakens” brought me back to being a happy little boy (and I should disclose I’m more of a “Star Trek” guy than a “Star Wars” fan). Even more, it’s actually the first film in quite some time that transformed the collective critical manboys and mangirls of Chicago’s media into the best versions of themselves today and many years ago. Now and before is what resonates most about what J.J. Abrams has pulled off so masterfully with the first new “Star Wars” film since “Star Wars: Episode III - Revenge of the Sith” in 2005. Having earned the acclaim of Hollywood’s current sci-fi master (while even being able to bat for both “Star Trek” and “Star Wars” teams), Abrams has bridged a beautiful divide between what’s nostalgic and what’s new. Strolling into a nightclub, for example, with strange creatures from throughout the galaxy pays familiar homage to “Star Wars” films of yore. The film even weaves in an unexpected amount of humor that pays off with dramatic emotion you actually feel, too. And none of it would have happened, by the way, without Abrams’ wife encouraging him to helm the film when he was otherwise not going to. Harrison Ford took quite a bit of convincing to return as Han Solo, too. 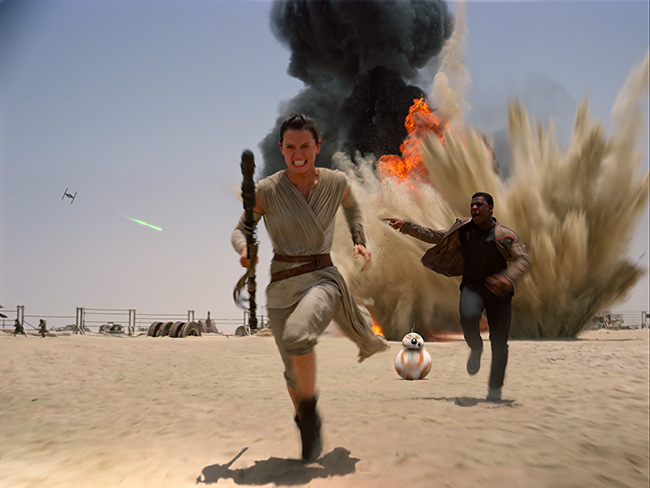 Read Adam Fendelman’s full review of “Star Wars: Episode VII - The Force Awakens”. Interestingly, this film’s Death Star-like “planet destroyer” takes more than a page from the “planet killer” doomsday machine in “Star Trek,” which J.J. Abrams also directed. To become one of the best films of 2015, it took bringing back much of the original team while discovering a new generation of actors – namely Daisy Ridley as Rey and John Boyega as Finn. The new era will propel the continuing saga into 2017’s “Star Wars: Episode VIII” (written and directed by “Looper” director Rian Johnson) and 2019’s “Star Wars: Episode VIII” (directed by “Jurassic World” director Colin Trevorrow and written by Rian Johnson). “Star Wars: Episode VII - The Force Awakens” stars Daisy Ridley, John Boyega, Oscar Isaac, Harrison Ford, Mark Hamill, Carrie Fisher, Adam Driver, Lupita Nyong’o, Simon Pegg, Andy Serkis, Gwendoline Christie, Peter Mayhew and Domhnall Gleeson from writer and director J.J. Abrams and writer Lawrence Kasdan. The film, which has a running time of 135 minutes and opens on Dec. 18, 2015, is rated “PG-13” for sci-fi action violence. Continue for Adam Fendelman’s full review of “Star Wars: Episode VII - The Force Awakens”. Daisy Ridley (left) as Rey and John Boyega as Finn in “Star Wars: Episode VII - The Force Awakens”.